Communism’s slide worldwide is due to its ambivalence towards globalisation and democracy. The Indian Left has shed that ambivalence, but it has no concrete alternative development strategy. Exactly a century ago around this time, Vladimir Lenin was in Zurich completing a manuscript that would go on to become perhaps the most consequential book of the twentieth century — Imperialism, the Highest Stage of Capitalism. It may not be the most widely read of Lenin’s works, but it is certainly the most important. It argued that an era of revolutions had arrived, since capitalism had entered a stage where wars for re-partitioning an already partitioned world among rival monopoly combined aligning to a powerful state. As a result, this would leave workers with the option of either killing fellow workers across trenches, or turning the imperialist war into a civil war for overthrowing the system. And since it saw imperialism as a chain of exploitation across the entire world — a chain that could be broken at its weakest link — it conceptually incorporated third world liberation struggles into the process of a world revolution. Imperialism brought world revolution on the agenda, and it developed Marxism from being merely a European philosophy, into a theory of world revolution. It provided the conceptual basis for a new International, the like of which the world had never seen, where German, French, Russian, and Italian delegates rubbed shoulders with those from China, India, Vietnam and Mexico. Subsequent events confirmed the prognosis of Imperialism to a remarkable degree. The First World War, the Russian Revolution, the post-war revolutionary uprisings across Europe, the rise of Fascism, the Spanish Civil War, the rise of Japanese militarism, Japan’s attack on China, the Second World War, the Red Army’s march across Europe to set up communist regimes, and the post-war revolutionary upsurge in Asia, were all part of a scenario that was in conformity with what Lenin had sketched. But, at the end of the Second World War, the world had started moving away from what one can call the “Leninist conjuncture”. The moment of dazzling success of communism was also ironically the start of its decline. Capitalism made three major “concessions” to ward off the communist threat: decolonisation, the institution of democracy based on universal adult suffrage, and state intervention in “demand management” to maintain high levels of employment (which in Europe meant “welfare state” measures under Social Democracy). The fact that democracy based on universal adult suffrage is a post-war phenomenon is often not appreciated. True, it arrived in Britain in 1928 when women got the vote (notwithstanding some residual property-based restrictions), but in France the first election based on universal adult suffrage occurred only in 1945. State intervention in “demand management” kept up aggregate demand and employment in advanced capitalist economies, and thereby facilitated high levels of investment, output growth, and labour productivity growth. High productivity growth in turn led to rapid increases in real wages since employment rates were high and trade unions consequently strong. Such intervention underlay in short what has been called the “Golden Age” of capitalism, the period from the early fifties to the early seventies. Ironically, the “Golden Age” of capitalism occurred not because of capitalism, but despite it, within a regime that was erected against its wishes (for it had opposed “demand management” by the state earlier, and is again doing so today), and, as a concession, it had to make to ward off the communist threat. In addition, the post-war period also saw the emergence of the U.S. as the unquestioned leader of the capitalist world. It also saw a muting of inter-imperialist rivalries, initially because the Second World War had weakened all the protagonists other than the U.S., and later, because of the emergence of globalised or international finance capital, which saw all partitioning of the world as standing in the way of its freedom to move globally. The era of struggles for repartitioning the world among rival nation-based monopoly combines was over, since such combines no longer held centre stage. In short, the Leninist conjuncture had been superseded; wars of course continued, but they did not express inter-imperialist rivalry, not even by proxy. The oft-repeated question, why did communism collapse so suddenly, has, I believe, a simple answer: because the premise upon which it was founded no longer held, the premise of an imminent world revolution. As this imminence receded, communism had to reinvent and restructure itself, to come to terms with a post-Leninist conjuncture, in order to remain viable. This was difficult enough; it was made more difficult by a common but undesirable tendency among revolutionaries to place moral purity above practical politics and deny the non-imminence of revolution. Though the Leninist conjuncture had ended with the war, this fact had not been immediately apparent. Besides, the prestige and affection earned by communism (even among many who found it otherwise unacceptable) because of its intense fight against fascism, camouflaged for quite some time the fact that it was losing ground. When someone was very critical of the Soviet Union, Professor Joan Robinson of Cambridge, used to say: “Don’t forget that but for the Soviet Union we would not be sitting here like this”, referring to the Soviet Union’s role in Hitler’s defeat. This had a paradoxical effect: during the “Golden Age” years when one would have expected the appeal of communism to diminish, it did not, while in the era of globalisation when the miseries of the working people are mounting everywhere and capitalism is attenuating democracy and the welfare state, communism, far from gaining ground, seems to be at a loss. Communism’s incapacity to deal with a post-Leninist conjuncture springs above all from its ambivalence towards globalisation. This is true of the European Left in general, and exhibited most recently by Syriza in Greece: no matter how objectionable it finds the hegemony of finance capital which characterises globalisation, it cannot contemplate shaking off this hegemony through a delinking from globalisation, because it sees any such delinking as a revival of “nationalism” which it abhors. Communist parties no doubt are less hamstrung by such considerations and more forthright in advocating delinking. But even though this may nominally be the case, they too lack any concrete strategy of countering globalisation. The Greek Communist Party (KKE) was strongly opposed to Syriza and bitterly criticised its capitulation to German finance; but it hardly had a credible concrete alternative of its own. Communism’s incapacity to remain viable in a post-Leninist conjuncture also has roots in an ambivalence it traditionally had towards democracy. From G.V. Plekhanov’s dictum, which was accepted by Lenin, that in any situation of conflict between the proletarian revolution and existing democratic institutions, a revolutionary must choose the former, communism tended to see democratic institutions, far stronger in the post-war world, as being secondary to the revolution that they believed was imminent. Thanks to this legacy it has ceded ground to a (non-Blairite) segment of social democracy as the primary defenders of democratic institutions which are under attack from finance capital in the era of globalisation. In countries where communists have shed their ambivalence towards opposing globalisation and towards defending democracy, they have remained a formidable force, and India is one such country. 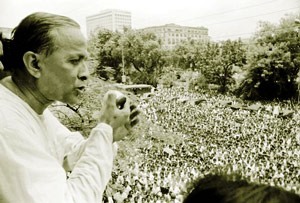 Some would contest this, citing the Communist Party of India’s support for the Emergency, the Communist Party of India (Marxist) preventing Jyoti Basu from becoming Prime Minister, and both parties’ withdrawal of support from the United Progressive Alliance government over the nuclear deal with the U.S. Each of these episodes, they would argue, strengthened the Hindu Right. Overall, they constitute evidence against the communists of not taking the act of strengthening democratic institutions seriously. But the communists’ culpability on these issues can scarcely be held against them. The CPI has been self-critical about its role during the Emergency; the CPI(M) did support the formation of the United Front government without Jyoti Basu; and on the nuclear deal the more persuasive argument is that the Left’s mistake was to allow the UPA to go to the International Atomic Energy Agency in the first place. What is true, however, is that even the Indian communists, despite being opposed to globalisation and associated neo-liberal policies, have not charted a concrete alternative development strategy. Their opposition has taken the form of identifying particular parties as neo-liberal and having no truck with them, which has hampered united struggles for the defense of secularism and democracy. But uniting with others in struggles, on platforms, and even in government, against the Hindutva and semi-fascist forces and on the basis of a concrete alternative agenda to neo-liberalism, will serve the people better. Prabhat Patnaik is Professor Emeritus, Centre for Economic Studies and Planning, JNU, New Delhi.